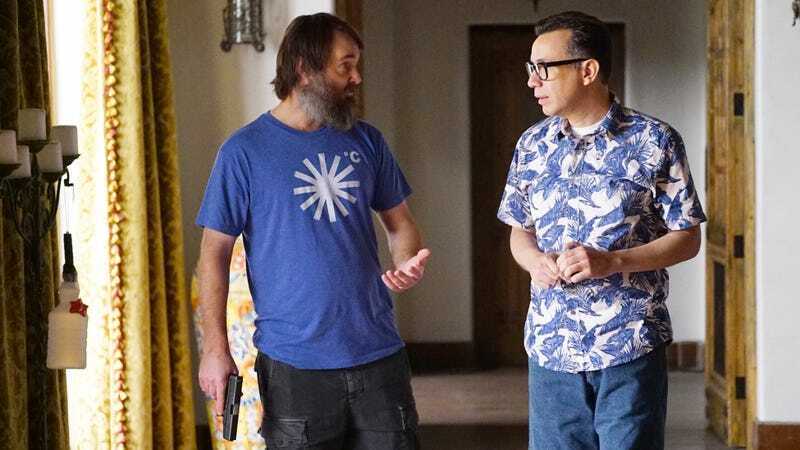 Due to FOX’s erratic programming schedule, only two episodes of The Last Man On Earth have aired this year, but that’s enough time to introduce yet another new character not long for this world. Karl Cowperthwaite (Fred Armisen), an awkward normie who moonlights as a cannibalistic serial killer, made his first appearance in a flashback episode back in January. After being arrested and sent to a maximum-security prison in Juárez, Mexico for multiple murders, he watches all his fellow inmates and guards die from the virus. Tandy and Todd eventually catch up to him before Karl commits suicide, and they quickly fold him into the group when Karl successfully trick them into thinking he’s actually a guard working at the prison. But by the end of the winter finale, Tandy and Todd catch Karl, who has struggled with his human flesh addiction since being around the gang, nibbling on a corpse and correctly assume the nefarious side of their new friend. In “Hamilton/Berg,” the series’ spring premiere and the first new episode in two months, LMOE disposes of Karl and that pesky Chekhov’s Cube, first introduced in “La Abuela,” in one fell swoop. I have previously addressed my issues with Karl’s arc, mainly that the character as written offers little room for development beyond its broadest outlines (Karl peaks when he sings along to Macy Gray while cooking up a dismembered corpse), and Armisen, though right for the role, gives a fitfully one-note performance. Karl has had some funny, offhanded moments, especially when he’s muttering casual small talk, and it’s metatextually clever that he’s clearly modeled after Armisen’s own personality, but there’s only so much the show can do before the situations becomes literally too repetitive. “Paint Misbehavin’” was a prime example of a show padding a 22-minute run time with the same kind of joke until it had nowhere else to go. Thankfully, “Hamilton/Berg” establishes an appropriate road map for Karl once the gang learns about his cannibalism: He either returns to prison until he dies or someone will have to kill him to save the others. When the first plan turns out to be a bust after he breaks out of prison and returns to the mansion, everyone, including Karl, accepts that execution is the only proper solution to this particular problem. Carol draws the short straw, but in a genuinely sweet moment, Tandy cuts his own straw to save his wife the horror of committing murder. Fortunately, Tandy never pulls the trigger because Karl solves the Rubik’s Cube at the last second, blowing him to smithereens. Credited writer Kira Kalush handles the last act of the episode well, balancing the grave nature of the situation and the absurd surrounding circumstances. Tandy and Karl’s final scene is a comedic highlight of the season thus far because both are unflappably polite about every detail of the cold-blooded killing, down to Tandy’s “death area,” i.e. a plain coffin. Tandy walks Karl through his Hamilton-themed execution in which Tandy plays Hamilton and Karl plays “Aaron Berg.” (When Karl tries to correct him with “Burr,” Tandy asks if he needs a sweater, which is the episode’s biggest laugh line and the very definition of a Dad Joke.) Forte plays Tandy’s outlandish personality just right in this moment, and Armisen is best when he’s playing off his former SNL cast member. As soon as Karl brings up the Rubik’s Cube, you know where it’s headed, but the precipitant tension is well worth a somewhat obvious conclusion. It’s a shame that the rest of the episode can’t live up to those final few scenes. Tandy and Todd’s successive vomiting, the drawn out post-confession scenes with Karl and the group, and the Jasper interludes (he’s still alive, in case anyone forgot about him and/or still cares) all feel like padding to get to that moment, which would be passable if they weren’t comedic dead weight. Armisen braying, “I’m baaaack!” in a sing-song deadpan before muddling through “Benny and the Jets” on the piano is funny in theory, but it gives too much space for a character that can’t hold anyone’s attention for too long. Now that Karl is out of the picture, maybe LMOE can move in a different direction that will get the series back on track. The other Dad Joke of the evening: Tandy asking Todd to give him a hand only for Todd to cheekily applaud.